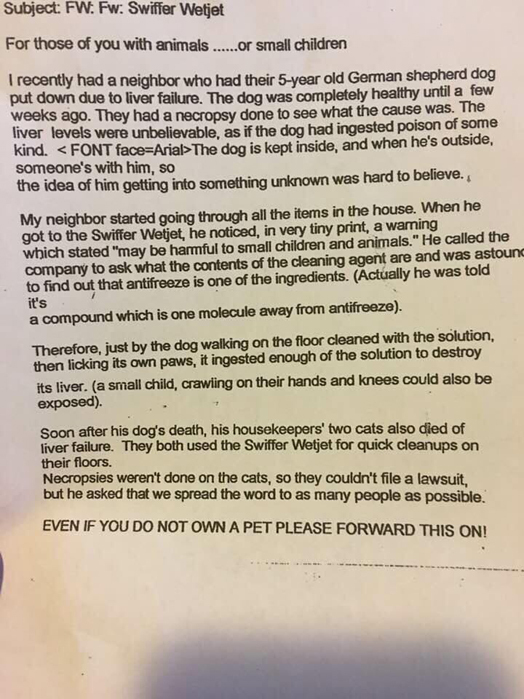 | General Discussion (Anxiety Free Zone) | Pets | Topic: Swiffer Wetjet and Pets 0 Members and 1 Guest are viewing this topic. Thank you so much for posting that. I have a Swiffer Wet Jet and use it a lot. Our dog likes to lick up any crumbs she might find on the kitchen floor which is a wood floor and I go over it quite frequently. So far thank goodness she hasn't shown any signs of discomfort but I'm not going to risk it. There are two different solutions that you can get with the wet jet. One is for wood floors and the other is for tiles like granite or lino in the bathrooms. I'm going to check them both out. Darn I just got refills for both. Apparently, it's an urban legend. Oh good! I was thinking of dumping it and I had just bought a new pack of pads. First I was going to take a look at the list of ingredients in the bottles of the cleaning fluids.